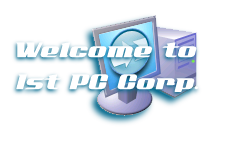 1st PC Corp has been for over 10 years working closely with leading US and Chinese companies, and government agencies in producing products that they really need. Our core strength is vertically integrated production customization that is highly adaptable in today's fast changing globalized world. We proud ouselves in coming up with products that you want in shortest amount of time, and this has become our biggest strength. We believe when we put your bottomline first, you will like to work with us and you'll be glad you did. Contact us today and see how we can help you to gain an edge on your competitors. It doesn't matter if it is as little as a screw, to something as big as a server cabinet, if you need to source products that you need, we are here to lend a hand, and you'll soon see what we can do. With our dedicated team of staffs, we are always trying to maximize efficiency in order to save costs, while still keeping a strict quality check procedure which includes various check points before the components are put together. See our company info here.